One of the more celebrated changes that came with the revolution in Egypt has come in who gets the spotlight on TV. The revolution was one of ordinary people, saying they should have a voice in decisions affecting the country. 25TV decided that should include decisions made in ordinary kitchens, too. 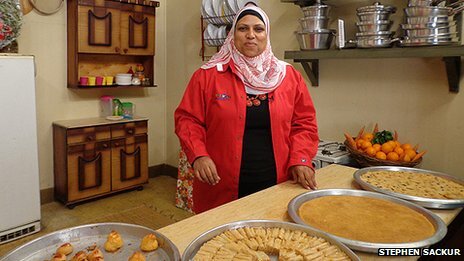 Rather than promoting famous, or foreign chefs, and expensive or fancy cooking, Ghalia Mahmoud, the star of a new cooking show on Egyptian TV, shows off great cooking for ordinary Egyptians. She helps her viewers learn how to make great, traditional meals on a budget. She also gives advice to the viewers who call in. Great Idea: Bring the focus to ordinary women doing a great job at their ordinary tasks. Practical Step: Put her on TV!